Rancho is the off-road suspension and shock division of Tenneco, a $4.2 billion manufacturing company best known for its ride control and emission brands. This suspension system was developed using a 285x75xR16 tire on a 16x8" wheel with 4.5" of backspacing (actual tire size 33.1x11.3"). The net raised height achieved with this system is dependent upon the adjustment of the torsion bars prior to installation. Example: If the Rancho System is listed as 3", but the torsion bars on a vehicle are adjusted to 1" over stock, the net raised height will be 2". The net raised height will be 1" less on vehicles equipped with the Z71 Off Road Package. 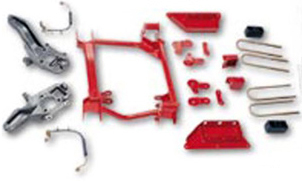 This Lift Kit ships via truck frieght due to the high shipping weight of this product. Please add item to cart for shipping cost or contact us for a quote. Rancho - a popular brand of suspension, shocks and more worldwide - was born in the 1950s in Long Beach, Calif., as Rancho Jeep Supply, and quickly grew into a thriving off-road and performance suspension components manufacturer. In 1988, Rancho launched what would later become its best-selling shock absorber: the RS5000. Rancho continued to grow and add fully engineered, industry-leading shock absorbers - like RS9000XL, Loaded quickLIFT, Pro Series and more - plus suspension systems to one of the worlds most recognizable and technologically leading brands. Rancho suspension systems, shock absorbers, accessories and other related products deliver rugged performance for work and play in any on - or off-road environment.